Entering the fifth day of Ramadan, Jakarta Deputy Governor, Sandiaga Uno, conducted Safari Ramadan at Suprapto Suparno Mosque, Jalan Pusdiklat Depnaker, RT 02/05, Makasar Urban Village, Makasar Sub-district, East Jakarta.
" 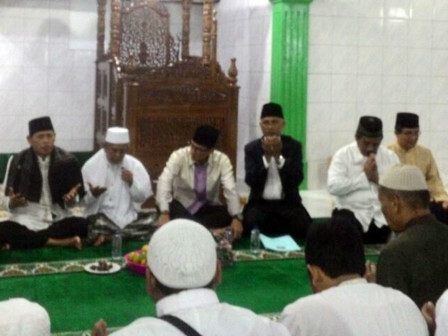 We want Muslims in Jakarta to keep Ukhuwah Islamiyah (Islamic brotherhood), but also the Ukhuwah Wathaniyah (brotherhood of the nation)"
On that occasion, he conveyed that the importance of togetherness of ulama and umaro in fostering people. "We want Muslims in Jakarta to keep Ukhuwah Islamiyah (Islamic brotherhood), but also the Ukhuwah Wathaniyah (brotherhood of the nation)," he stated, Monday (5/21). He invited pilgrims who present to improve faith and piety, to charity, and to prosper the mosque. Additionally, he asked them to keep maintaining cleanliness and security of the environment. "Asian Games will be coming, so let's make Jakarta that is clean, safe, comfortable, and conducive," he expressed. Suprapto Suparno Mosque Caretaker, Suwardi stated that he was pleased with the Ramadan Safari activities conducted by umaro. "This is very useful to tighten the silaturahmi (togetherness) and absorb the aspirations of people. Alhamdulillah (thank God), we are very pleased with Mr. Sandi's presence," he stressed. As for the information, Sandi also gave aid to the needs of mosque. It was also attended by East Jakarta Mayor, Bambang Musyawardana; Jakarta Transportation Dept. Head, Andri Yansyah; East Jakarta Vice Head, M Anwar; and East Jakarta Secretary, Usmayadi.